Information technology is a great enabler of health care. Whether it is about raising productivity and shortening waiting lists, empowering and informing patients, equipping health care professionals or improving efficiency for surgery and treatments, health informatics (HI) and technology play a major role. It is well documented that roughly 1 in 10 hospital patients is harmed by medical error. This ebook contains a stimulating selection of material by HI experts on the latest developments that aim to address this problem. Articles cover areas such as robotic surgery, how technology can support people in their own homes and how well-designed and wisely implemented electronic systems can help reduce risk to patients. 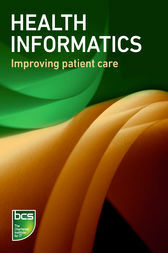 Readers do not require a detailed understanding of health care or health informatics.